If this outfit looks familiar it's because I pretty much recreated it from this post. What can I say? I liked it, but the real life version was even better. I cannot tell you how much I love this cardigan from The Mint Julep. It's that perfect weight that transcends seasons. I'm one of those people that will happily wear sweaters and long sleeves year round - it's practical for those chilly nights and I love the balance. I'm already dreaming of wearing it while watching the sun set over the beach. There will also be a picnic and maybe a small fire. For now, I'll settle for these up and down temperatures as long as it's officially called "spring". PS. The arrow ring came in this month's rocksbox and I am obsessed with it. You can still get a discount with the code "proseccointheparkxoxo". Ahhh that top is so pretty! Love that color on you! Look at you busting out the spring looks! Love it! 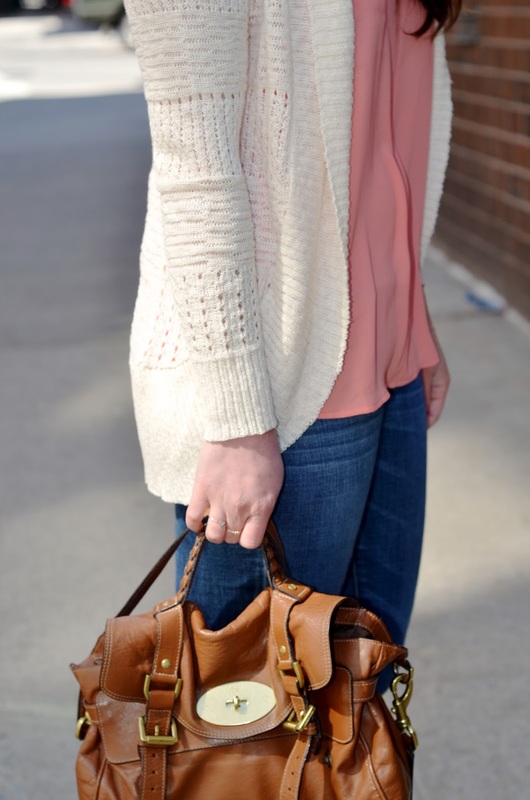 Love the cozy casual look! The necklace is darling too. Such a gorgeous outfit. I love your peach top! Love this! Such a pretty colored top! Your hair is perfect! You look absolutely lovely. And I am completely obsessed with that ring too!